Apple has eliminated so many annoying little hang-ups that you might run into when using the old one. The GPS pinpoints to meters instead of blocks. 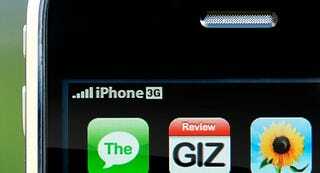 The 3G connection slashes web loading times by minutes to seconds. The more rounded case feels great in the hand. And most importantly the new software polishes the OS and opens the phone up to nearly unlimited capabilities through the countless programs that are already being written by the brilliant legions of faithful developers. It's kind of cool. Click to viewIf you want to cut to the chase, the software is what we're most excited about-so much that we ran the first half of this review earlier extolling the iPhone 2.0 virtues in detail, including the fact that it's a free upgrade for the people who snapped up the first iPhone, perhaps before it was ready. On the software side, the iPhone has the most advanced touchscreen OS out there today. Scrolling, dialing, panning, zooming, touching and pinching are all actions you can do to get around your photos, your maps, your movies, your music and of course, your phone calls. The iPhone 2.0 update improves on the already great communication features such as desktop-class email and web browsing by adding MobileMe and Exchange support-both of which push emails to your phone as soon as they're received, just like on the BlackBerry. These two new additions also allow your phone to always sync contacts and calendar events with your computer or your office's system directly over the air, without ever needing to dock, or take any action. There's also the App Store, which gives you access to a gigantic library of third-party applications to add features such as controlling your iTunes, instant messaging, 3D gaming and To Do lists. One drawback is that Apple may not support the cool (illegal) apps like the NES emulators and video recording programs that don't work through the SDK. Lots of unofficial third party apps may never make it to the store. One, Instinctiv, a super iPhone music shuffle app, was recently denied store sales because it is against the terms of agreement to enhance the iPod or iPhone music playback in any way. Huh?! Apps also take a long time (minutes) to install and uninstall, and backups now take awhile longer than before. Annoying, but still worth the wait. The fact that the free software's advantages are available on the original iPhone means that the reduced subsidized price $199 for the 8GB and $299 for the 16GB are good, but maybe not good enough to justify a trade-in. (The $10 extra a month for 3G access is a wash, frankly.) Quite a conundrum for those of you tempted. Onto the hardware. Let's start with the husk: Once, I sat down on a twisted key, putting a giant scar across the aluminum back of my iPhone. With that one exception aside, my iPhone's abused-to-hell case still looks strong and shiny. The new case is made of smudge-able plastic, and last time I checked geek material lust hierarchy, plastic was a distant ranking of 452342 places behind aluminum. The effect is that the case, feels lighter, warmer and thicker but also cheaper than before. And in your hand, picking up a slightly warm iPhone, it feels almost more organic. Between that and the the rounded shape, which fits far better in the hand, it's like you're cupping a warm baby bird. The old phone by comparison feels like its a better quality device, with the spiritual heft of a German machine. The new case is lighter but actually thicker; still, it feels less significant and durable. The case did survive being put in a bag full of keys and rubbed vigorously. Only some of the silver Apple logo on the back got visibly scratched. The case is also a lot easier to send radio waves through than the previous case-useful as this phone has many more radios-although reception improvement was not noticeable. [UPDATE: Actually, it is much better, in both EDGE and 3G mode] Also, if you place the new model on a table, it rocks when you tap the screen, so you can't use it as a table top computer anymore. And the case is very easy to smudge. The black color is available in both sizes, but the white only comes in pricier 16GB, much to the chagrin of boyfriends who promised to buy their significant others one in the pale tint. The screen is slightly warmer in color temperature (more yellow than blue), slightly brighter (even when considering decay over time) and the daylight viewing is better, but it's the same 3.5-inch, 480x320 resolution screen. And it's still gorgeous. Oh, the headphone jack isn't recessed anymore, so you can use whatever headphones or adapters you want. And the lock and volume buttons are recessed slightly more and are metal. The speakers and earpiece have a metal grill behind them. All this, to great effect. To mention the 3G is to bring up painful memories, the time I've lost waiting for web pages to load on the iPhone, or standing on street corners waiting for maps to load. Our tests in AT&T's aggressively built-out NYC area showed the 3G connection is 4.8 times faster than the old EDGE connection. When you turn off 3G and do an EDGE-to-EDGE test between older and newer models, they both perform the same. The GPRS (850, 900, 1800, 1900) and UMTS/HSDPA (850, 1900 and 2100 MHz) cellular radios have the advantage of some design improvements, including the use of the steel ring around the screen as an antenna and the electronic transparency of the now all plastic back. Wi-Fi reception is better. In a side-by-side test with the old iPhone, we walked away from an access point, the old iPhone's connection died at 100 feet and the newer one lasted to about 120 feet. And there's a new Airplane mode that turns off cellular but powers up Wi-Fi for airline internet. At the end of a day with lots of email and browser use, or media playback, my old iPhone would be begging for a serious dock charge. How does the iPhone's 3G connection affect that? The downside of such speedy downloads is a reduced battery life, something the original couldn't stand to lose much of. We're do more testing of that soon. But here's an interesting thing: According to the data out there, the iPhone 3G has better battery life using 3G than the old iPhone does using EDGE. Let me explain. Apple's official browsing battery life rating on Wi-Fi is 6 hours for both models. They never rated the EDGE battery life but most testers found it to be about 25% less than Wi-Fi. That's 4.5 hours. The iPhone 3G rating is 5 hours of browsing. Apple is claiming that it's 5 hours for both the new iPhone 3G and the EDGE on the old one. We shall investigate such claims soon. But I wish Apple would take me up on my idea for using the 3G only for active browsing, maps and certain apps that need it, dynamically switching to EDGE for IMing, email downloading and weather checking. UPDATE: Battery life has been noted to drain very quickly, but because I find myself using the phone a lot more often thanks to the added usefulness of apps. 3D gaming is also a killer on battery, far worse than anyone has claimed so far, thanks to the constant use of CPU, GPU and LCD backlight. Here is a roundup of nine battery tests taken from the best reviews, averaging about 5 hours for 3G talk (good) and 3-5 hours for "mixed use". Regardless of life, here are some tips on increasing iPhone 3G endurance and some gadgets that can help extend battery life. Phone-wise, I decided to lower my minute plan. I completely have stopped using my old iPhone for voice in San Francisco's spotty network, and even when I'm connected, everyone sounds like they have marbles in their mouth. Network problems aside, the good news is that basic voice quality issues have been fixed. Doing side-by-side calls, the difference when using the new phone and old is like the difference between talking to someone with their hand over their mouth and with their hand taken away. While the new iPhone's speaker and mic definitely improve sound quality, it seems packets do matter too. When the the phone is running on a 3G network (in downtown NY), calls sound especially clear compared to the old iPhone. But when both iPhones are on EDGE, the call difference is noticeable, but not night and day. Even the speakerphone's audio is much louder and so, music played through the mono speaker is also improved. As for reception back in spotty coverage areas, I'll have to do a side-by-side soon to let you know how that goes. UPDATE: I could make no calls before in my house. Now I can, in both EDGE and 3G mode, with good (not great clarity). This is fantastic. The old iPhone's location detector was accurate within a few blocks, using Skyhook's system of logging cellular towers and Wi-Fi spot MAC addresses and pairing them with physical addreses. I thought it was fine for making sure when I searched for an ATM machine, it would only return local results. The new A-GPS system is accurate within meters, though, opening up the iPhone to more useful location-based apps, maps and geotagging of photos. The A-GPS helps get quicker fixes in the city, compared with a typical PND. However it doesn't refresh as quickly (every 5 to 15 steps), and won't give you a "heading-up" view, so when you're walking, it takes a bit longer to figure out where you're going. This is clearly optimized for walking, though in a pinch it could help lost drivers. The greater accuracy isn't the only reason it's better than the older iPhone: The ability to track your path is a nice enhancement too. The time to GPS lock is between 1 and 10 seconds, using a combination of Wi-Fi and cellular as well as GPS. But don't even think about using this for regular car nav: there is no voice prompting, nor is there automatic turn-by-turn. Apple didn't write a dedicated turn-by-turn navigator for driving, with voice, but now we hear that companies are making them, so we look forward to revisiting this once real navi apps are out. The old iPhone's software can take a photo and email it or send it to a MobileMe gallery, but the camera itself is relatively weak. It won't capture video, and I've lost countless YouTube hits by not having a video device at the ready. This situation has not been improved much. UPDATE: One nice thing we've finally confirmed is that the dreaded buzz you got with speakers and tape adapters too close to the iPhone with the GSM connection running during calls or data disappears when you're running 3G. The new camera has the same 2MP shooter which returns 1600 x 1200 pixels. There still isn't video capture. Image processing seems to be slightly less grainy but it's not something you would notice. The MP count would be fine, but the low-light quality is still terrible. Nokia and Motorola have built thin phones with better imaging, why not Apple? And Apple's forte is software, so why can't they beef up the software tools, by adding image stabilizers and noise reducers, not to mention Photo Booth-type frames and effects? Inside the box: A new smaller USB charger the size of an ice cube, headphones, a sync cable and a SIM eject tool. There is no longer a dock included to use with the cable. This is really not a revolutionary phone. It's more like the iPhone we wished Apple made last year. But basics, like cut, copy and paste are still missing. (As is MMS, thanks for the reminder, commenters.) As well are the ability to use the phone like a hard drive. Other than that, we're hoping for some more revolutionary changes to come by software update. And let's take a moment to remember how many developers are making killer iPhone programs right this second. There's the revolution. So the hardware is interesting in the iPhone 3G, but the real story here is the new iPhone OS 2.0 firmware, which we've written about in depth here. You manage to install that, old iPhone users, you've got about 80% of this new iPhone's mojo. But if you're not making your calls on an iPhone yet, well, what are you waiting for?